Bishop of Jarrow the Rt Rev Mark Bryant, Maulana Ataul Mujeeb Rashed imam of London Mosque and Iain Wright at last year’s Peace Seminar in Hartlepool Mark Payne Published: 06:00 Wednesday 22 November 2017 A yearly event promoting peace and unity will take place in Hartlepool this weekend. The town’s Nasir Mosque in Brougham Terrace will welcome a number of guest speakers and civic dignitaries for the Annual Peace Seminar on Sunday afternoon. 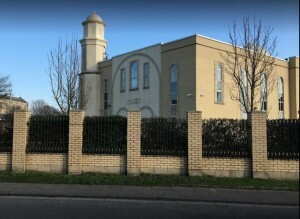 Tahir Selby It is organised by the Ahmadiyya Muslim Community to bring religious, political and community leaders together. The central theme of this year’s conference will be on global conflict and the need for justice. Mosque Imam Tahir Selby said: “This will be the third year running that we have held a Peace Conference. “We aim to hold it around Remembrance weekend but this time there has been a bit of a delay because one of our guest speakers could not make it around that time. “Our purpose is to open up the mosque to people as much as possible and bring people together.” The seminar’s key speakers will be Father Michael Griffiths, the Parish Priest of the Holy Family Hartlepool, Hartlepool MP Mike Hill, Barry Coppinger, Cleveland Police Commissioner. The main speaker will be Rafiq Hayat, the National President of the Ahmadiyya Muslim Community. Mr Selby added: “It is not just about religion. We are trying to bring in people from all different walks of life to talk about peace and find hopefully some unity and methods of how we can resolve the present crises in the world. “This year we have got the new MP for the town coming and different charities. “In previous years we have welcomed the bishops of Durham and Jarrow.